For months now, I've read about The Hunger Games everywhere; on Twitter feeds, on book blogs, on Facebook, and even the news. In addition to reading about everybody's obsession about this novel, the upcoming movie had driven me to finally read it and needless to say, I was blown away. 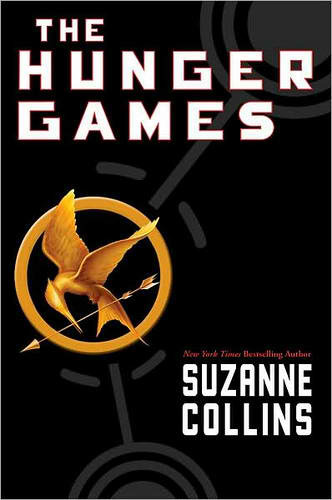 I am FINALLY able to understand the commotion; The Hunger Games is simply amazing! The Hunger Games takes place in a dystopian post-apocalyptic world not unlike George Orwell's 1984 (1949), where our heroine and protagonist Katniss Everdeen resides in District 12. In Katniss' world, there are twelve districts surrounding The Capitol, which rules over all districts. Each year as "punishment" for rebelling against The Capitol several years ago, one boy and one girl between the ages of 12-18 are randomly selected from each of the twelve districts to compete in the Hunger Games; a post-apocalyptic version of a reality-game show where the opponents kill each other off until one remains standing. The winner is then allowed to go home to their district with gifts and riches in hand for their people. 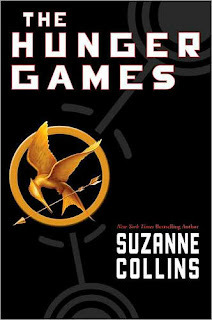 When Katniss' younger sister is selected to compete in the Hunger Games, Katniss steps up to take her place instead, already deeming herself a hero in this fascinating novel where she fights and battles her opponents to the death but not without feeling. I know The Hunger Games has been analyzed and reviewed in hundreds of places online already, so without segueing into the many reasons for this novel's greatness, I'll say this: it embodies every element that makes it a perfect novel with enormous character depth. The sadness and intensity of the novel will keep you reading diligently until the end -- you won't even WANT to take a break! In addition to the suspense and action amidst the Hunger Games arena, Collins offers a romantic tryst and forges unforgettable, strong bonds between her characters. In addition to Orwell's 1984 , The Hunger Games also reminds me strongly of Margaret Atwood's The Handmaid's Tale (1985). The love and trust developed between Katniss and her supporting cast along with the numerous tragedies will truly make you hunger for more to the story, which Collins' duly delivers with the sequels of Catching Fire (2009) and Mockingjay (2010). Although this novel is considered part of the Young Adult/Teen genres, I highly recommend it to all audiences, especially fans of fantasy and science-fiction. What did you think of The Hunger Games ? Does this novel remind you of any other post-apocalyptic novels and if so, which ones? I am a fan ... I have read all 3 books and can't wait for the movie!